Throughout the week, Command members have discussed the issues that have raised questions within our community. Namely the lacking number of applicants, a lack of diversity mission statements, as well as training pipelines that are not existing or fleshed out. These issues have created an environment that is not as fun for the average player, therefore less appealing. As a community, we need to come together to make changes. Focusing on aspects such as uniforms, call-signs, and armory are irrelevant - at the end of the day, the player-base is what brings us together. The vote was pretty clear, ASPIS will remain a TASK FORCE consisted of SAS A/2 and CAG B/1. These two units will have unique mission statements and areas of expertise that will be reflected in their Missions and gameplay. The Special Air Service will be our primary Recce element, providing ISR and long range fire support. The SAS will be able to deploy deep within enemy lines, gather Intelligence and provide pre/post assault Reconnaissance. Due to their mission statement SAS training will focus on Surveillance and long range RECCE/long range target interdiction operations. The Combat Applications Group will be an Assault troop specialising in direct action. 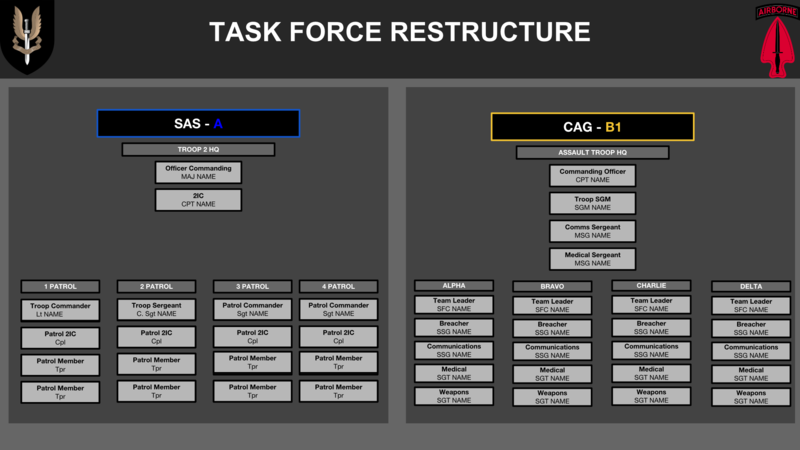 CAG will act as the Task Force surgical strike team, tasked with specialized missions primarily involving hostage rescue, counter-terrorism, as well as direct action against high-value targets. Due to their mission statement CAG training will focus on CQB, Raids and Hostage rescue.